Titus Contracting remodeled two complete studio units in record time! Work included removing old bathroom cabinets and shower tubs, relocating bathroom walls and setting a new bathroom door. These sparkling new bathrooms were finished with new light fixtures, nice clean cabinets, and fresh paint. This project also required a complete rework of their kitchens. New kitchen walls, plumbing location and light fixtures were completed. Crisp kitchen cabinets, durable countertops, and shiny new kitchen appliances were installed to complete these stunning kitchen makeovers. Our tenant customers are extremely happy with the results. Way to go to our subcontractors and Titus team members! 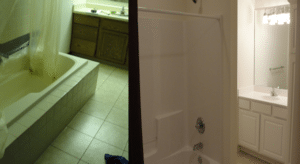 Please click to visit us at TitusContracting.com, Homeremodelers.com or our Facebook Page to see our latest ongoing commercial and residential remodeling projects around the Twin Cities. Thanks! Kitchen Renovation: Before & After.